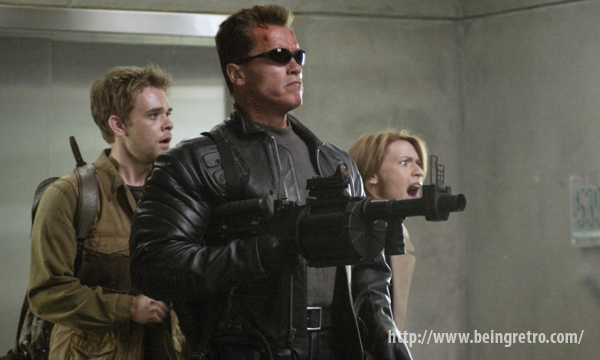 Being Retro: Terminator 3: Rise of the Machines (2003) - WELCOME TO TERMINATOR WEEK! Terminator 3: Rise of the Machines (2003) - WELCOME TO TERMINATOR WEEK! Terminator 3: Rise of the Machines is the 2003 sequel to Terminator 2 released by Warner Bros. domestically and Columbia Pictures internationally, directed by Jonathan Mostow and starring Arnold Schwarzenegger, Nick Stahl, Claire Danes and Kristanna Loken. As a result of the destruction of Cyberdyne at the end of T2, the Skynet takeover has been postponed, not averted. In a last attempt to ensure a victory by the machines, a new terminator, the T-X, is sent back to kill as many of John Connor's future lieutenants as possible, including John Connor and his future wife Kate Brewster. After Connor's future self is terminated by a version of his previous protector, Kate reprograms it and sends it back to save them both from the T-X. Just because we try to take over the world, doesn't mean we should! She's been on Burn Notice and has several films coming out this year. That movie got so much slack and I really liked it. Another fun movie. Not the best casting, but they can't all be Michael Biehn! I'm going to have to watch these again. Terminator gets the pulse going for sure.. "I cannot self terminate." - classic. Not certain on seeing this new movie as the last two were bad in my opinion.